Next Gig for the Jordohn Bileau Collective! No time to update you on my travels from the past weekend... but just wanted to tell y'all about our gig this weekend.... 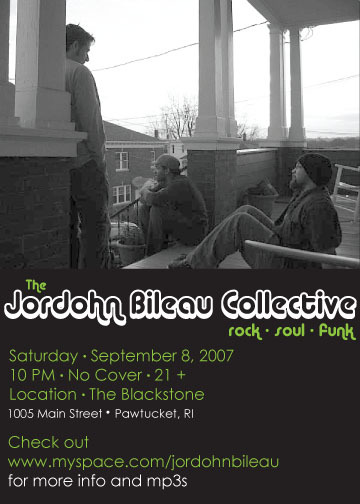 The Jordohn Bileau Collective at the Blackstone in Pawtucket this Saturday!!! Hope to see you there!!! CLICK HERE to get to the JBC myspace page!!! Check out the Wikipedia page HERE.